Submit written reports of original research efforts after which top submissions will be required to make a presentation at the live symposium for the top awards. At the Regional Symposia, the first round of judging will occur where the students’ written reports are reviewed by a scientist or expert in the field. Resulting from this review, selected students are invited to orally deliver their research before the Regional Symposium. Selected presentations will represent the finest efforts of high school students in the state or region toward either original laboratory research, field research, or applied research. 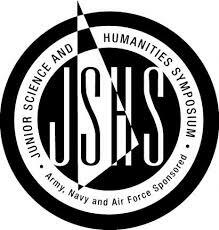 Judging of the oral presentations is the final step to select student delegates who will advance to the National JSHS. At National, student research presentations will be organized in concurrent sessions by discipline. Military-sponsored undergraduate, tuition-based scholarships and other awards will be made to 1st place finalists and runner-up finalists from each of eight (8) final sessions. Regional and National judges evaluate the oral presentations using the below criteria. National judges rank each of the presentations based on the criteria and using a scale from 1 to 5. The scores are tallied for each presenter and used as the basis for discussion among judging team members where each criterion is considered. Logical conclusion relevant to the research problem. What was learned? Did student recognize contribution to the field?